-Only earns event currency for week 2 content. Not a bad buy, although I think there are better buys. I got this because I liked the skate park. I think it’ll work well with a design to include some of the *shudder* Bart Royale items, so I liked it. Nikki was an added bonus. What are your thoughts on Nikki and the Skate Park? Will you be spending the donuts to bring it to your Springfield? Did you already? Why or why not? Where have you placed it in your town? Design plans? Sound off in the comments below, you know we love hearing from you! And feel free to share some photos of your design plan as well! If you need help (or a refresher) posting photos in the comments, check out this post. This entry was posted in Should I Buy, Tapped Out and tagged Love Springfieldian Style, Nikki McKenna Tasks, Should I Buy Nikki McKenna, Should I Buy Springfield Skate Park, Springfield Skate Park Size, Tapped Out Tips and Tricks, Tapped Out Valentine's Day Event, Task at Springfield Skate Park, The Simpsons Tapped Out, TSTO Addicts, TSTO Love Event, TSTO Tips and Tricks, TSTO Valentine's Day 2019, What does Nikki McKenna Do, What does Springfield Skate Park Do. Bookmark the permalink. I’m always kinda surprised that she doesn’t got more fans. I always considered her one of the best of Bart’s romances. Totally loved her as a character. Bought them, happy I did. Then watched S21E15-Stealing First Base, S23E02-Bart Stops to Smell the Roosevelts & S24E01-Moonshine River. I dunno, only helps with week 2…? Posted this a couple days ago, but thought it might help sway a couple of undecided tappers, so here it is again. I like the use of the entryway…gives the whole park a little more “you don’t want to be here after dark” feel. Now if you can get all the “bad boys” do tasks there 😄👍. It swayed and inspired me, so mission accomplished! I bought this straight away (I KEM farm so I get all sharacters) but I was disappointed with the skate park itself…. I will be hiding it behind a building. Loving the event though. One quick question if I may…. How many Shelbyville and Zenith buildings have we been able to get in the past? If I’m not mistaken this is the only new item in this event with a bonus %? I bought it too because I liked the skate park. Bom eu só sei que não tem mais nenhum personagem na minha loja,porque já comprei tudo! 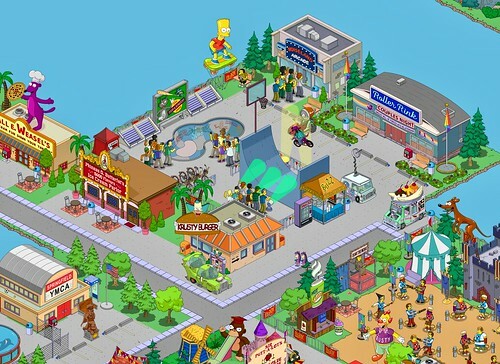 Are either Bart’s task there, and/or any of her tasks visuals of them using the skate park? I bought it. It’ll go in my sports Park area. Going to buy this, i like the look and also having Bart with a task there help in deciding, thanks for the SIB. I hope that she will eventually appear in a mystery box? I love the skate park, but I will pass for now. Instant buy for me as I loved that episode. It was a past event.